by the way has any one reached 120km/hr ????? guys can anyone tellme that since ive change the front light of my bike which i bought less then a month back, ive installed a honda deluxe fairing , so is the bikes warranty void ??? my bikes first checkup date is on 2nd aug, ill b going to akbar road for tunning so will the suzuki ppl say that why have u changed the light and things like that and now the bike is not in warranty period,can any body clear this thing.ill be more than happy. Mine is a TTR, made in China, CM-T1-2 - TTR PIT BIKE, this is my ride. guys can anyone tellme that since ive change the front light of my bike which i bought less then a month back, ive installed a honda deluxe fairing , so is the bikes warranty void ???. after a week i'll be going for my first tune up, to suzuki ferre road showroom (where i bought the bike). any tips? what to look for or what to tell the mechanic to specially check etc. also i've heard people in this forum and on other sites that untill 1000 km i should use mineral oil instead of synthetic oil. i got my bike serviced today.the rear drums color started peeling off.so does this color thing comes under warranty??? and can i get my drum changeg under warranty ,and the handle of my bike is also rusting and so is the rear mudguard from inside.my bike is under warranty 6months.can anyone give advice as to what i shud do?? ?can i get all three things replaced??????????????? YUP it should be covered under waranty if it has no physical damage due to impact. i bought a gs 150 last month n its done about 970kms. i faced a similar problem, the engine's exhaust pipe caught rust and seems it wont last another 6 months. so when i went to the dealership for the free tune-up, i showed them the rust and filed a claim. inshaAllaah they said they'll replace it within 10-12days....so there u go, rusty parts r replaced if within warranty. meter k sticker pe jo marzi print ker lo.. 60 ka 100 kr lo.. 90 ka 160 ker lo.. koi nahi poochta.. Yes, M/s Alsons make far better quality meter products. 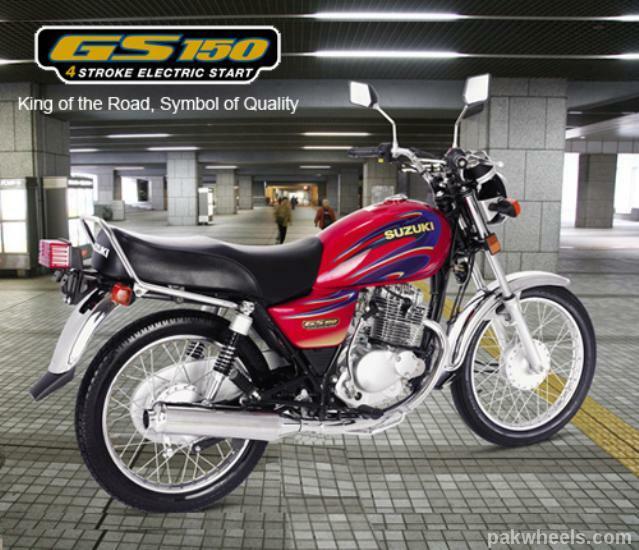 Bhaio abhe 2012 chal raha hy Allah ny hamen b tofeeq di or ly aya suzuki 150 gs.... Ghazab hy emaan sy. aaalaaaaa, honda valey to etnay maghroor hn ki ab lift e nahe kratey jo 125 kiliay aye. suzuki valey sr ankhon p letay hn. (Marketing) . khyr khaas baat ye hy ki bohot mention hua upar ki 125 beat kr deta hy gs 150 ko. Log aadi hn honda 125 ki pick k. Suzuki ka pick lenay ka style different hy (tested) Suzuki hamesha apni game 3sry gear sy start krta hy ap pehlay 2 gear mt khinchen 3sray me atay e ap ko andaza ho jaye ga ki ... take off mode me bike (suzuki 150 gs) a gya hy. believe me asy e samjha pehlay honday ki tarah bhgaya to cheekhen nkil gaen bike ki lekin jb suzuki ki tarah bhagaya to janab 120 me ny 4othay gear me e kr lia roads choti hn ziada kheench nahe ska or me ny bohot km 5van gear lagay hy es shehzaday pr. (actually es new bike lenay sy pehlay meray pas 2005 suzuki 150 gs tha). The Suzuki GS150 model in India seems to be alot more polished than our local model. 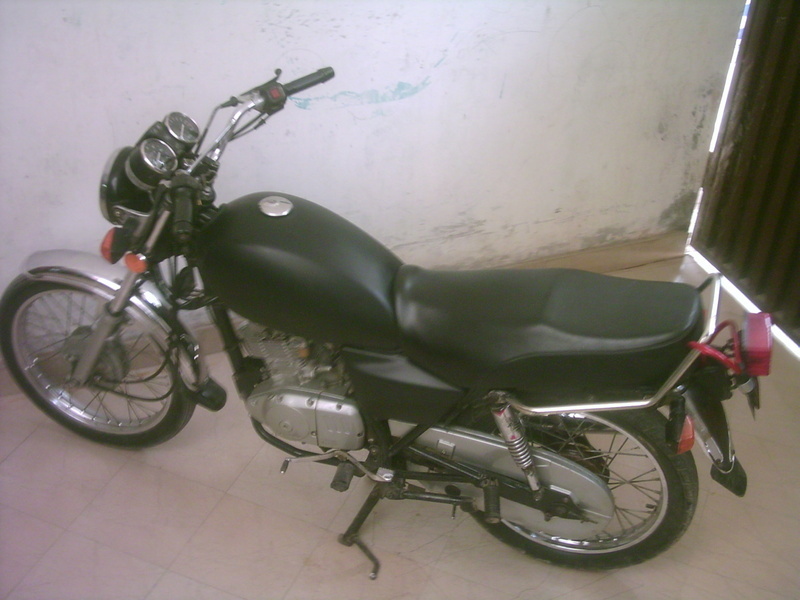 Dear All - please guide as I have Suzuki GS 125, 2008 Model, resided in Lahore and want to make some cosmetic modification of my bike. But don't have any idea where to go and what to do to get the desired look that I am dreaming for my bike. Details are as below. 1. Alloy rims are required. 2. Foot Rest Covers are required. 3. Tail is required which can cover the carrier and lowr portion of seat. 4. Front and rear fenders are required. 5. Alloy side mirrors are required. 6. Heavy duty rear tyre. 7. Front and rear disc brakes. Please suggest any point where I can get these things from and in Economical rates as well. Thanx in advance. Looking for the usual response of you all. but sprinter meter not showing accurate speed.